Early Tuesday morning July 25, 2017, American Eagle Staff loaded up the vans and traveled to the hack tower overlooking Douglas Lake. This was a very special day, because three strong and healthy eaglets were to be released into the wild! ER2 and ER3 were hatched in the nest of AEF’s non-releasable Bald Eagles Eleanor and Mr. Roosevelt, whose nest is located within the aviary on Eagle Mountain Sanctuary at Dollywood. Eleanor and Mr. Roosevelt were first-time parents, and tens of thousands of viewers watched AEF’s online video cam as they navigated the learning curve of brooding, rolling eggs, & first feedings. They were so diligent in providing baby bites to their eaglets, and successfully cared for these little ones, giving them a great first start toward their path to adulthood. The eaglets thrived! After several weeks in the nest, they were “graduated” to the Hack Tower to finish growing and to bond with a more natural environment before their release. Off site, in AEF’s breeding facility, another non-releasable Bald Eagle pair, Honor & Braveheart, welcomed their youngster into the world. HB thrived, growing into such a very large female eaglet that her caregivers began calling her “Little Honor” after her parent as a nickname. First to be released at 14 weeks 5 days old was ER3. Based on measurements and calculations, (Patagial wing tag ID A7) this eaglet was determined to be a male, and weighed a solid 7 pounds and 2 ounces. He was given the name “Courage” by AEF volunteers Paul and Laura Albert, in honor of their son, Connor Rosewall (1994-2017). 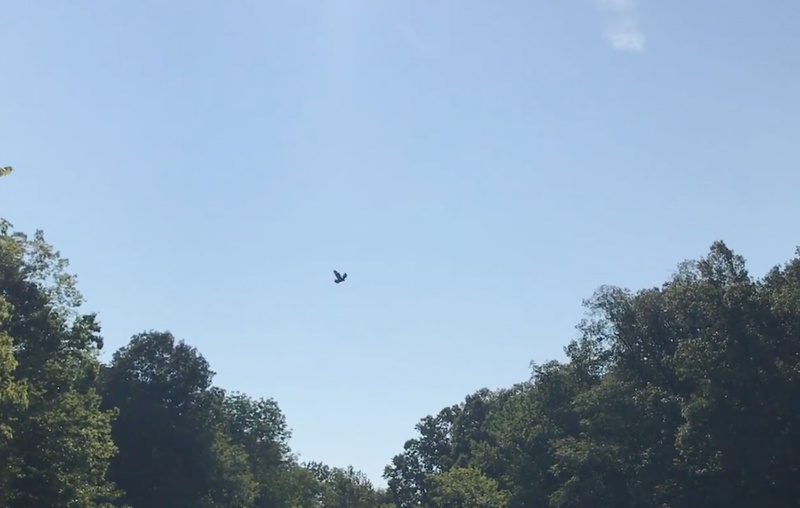 “Little Honor” was the 2nd eaglet released from the hack tower, and her first flight was amazingly strong as she soared over the lake. Soon after being placed in the Hack Tower, AEF staff noticed that Little Honor’s wing was injured. Total rest was provided until she was fully recovered, so her fledge date at the age of 18 weeks. Little Honor was fitted with Patagial wing tag H7, and weighed 9 pounds 5 ounces. AEF founder & president Al Cecere holds Bald Eaglet Little Honor – released July 25, 2017. 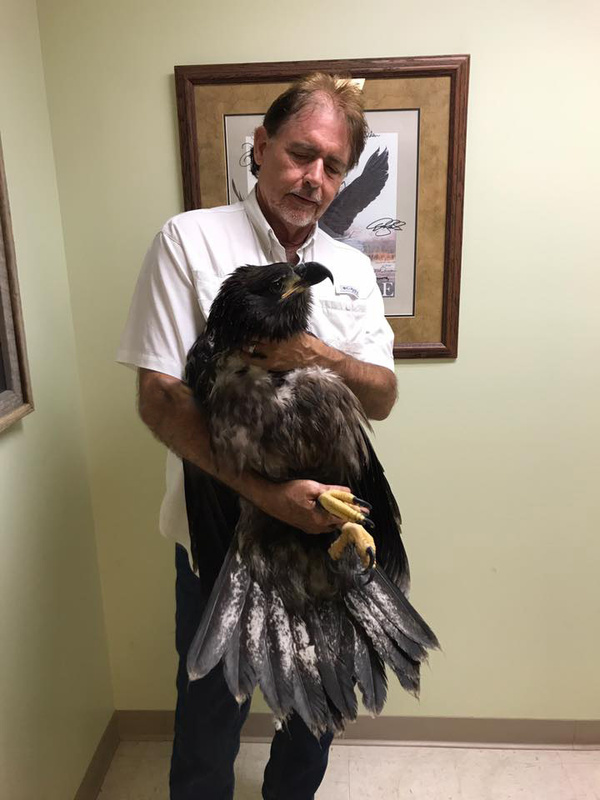 A huge female eaglet, she was hatched by AEF’s non-releasable Bald Eagle breeding pair Honor & Braveheart. © 2017 American Eagle Foundation. The third eaglet to be released on the morning of the 25th was 15-week-old ER2, given the name “Shaconage” by AEF founder & president, Al Cecere. Shoconage (pronounced Sha-con-ah-hay) is a Cherokee name meaning “the place of blue smoke.” A male, Shoconage’s weight was 7 pounds 10 ounces, and his patagial tag is R7. All three eaglets were tracked with GPS trackers for a few days since their release. At the time of this post, they are all doing very well; hanging around the hack tower, learning new skills. They are slowly moving further out as they figure out how things work. If need be, there is food placed on the hack tower if they need to return for a re-fueling. Eaglets are released at approximately 13 – 14 weeks age, when they would typically first be capable of flight in the wild. By this age, they will have reached full adult size, with a wingspan of 6.5 to 7.5 feet! Before being released, each Eaglet is fitted with a wing patagial tag and also leg bands that identify the location and date of the release. Each eaglet released is also fitted with a radio transmitter so it can be monitored within the Douglas Lake Cove area. Food is left along the side of the lake for several days in case the Eaglet is unsuccessful in finding food for himself during this time. The radio transmitter is discarded when the tail feather to which it is attached molts. Read more about AEF’s hacking program.